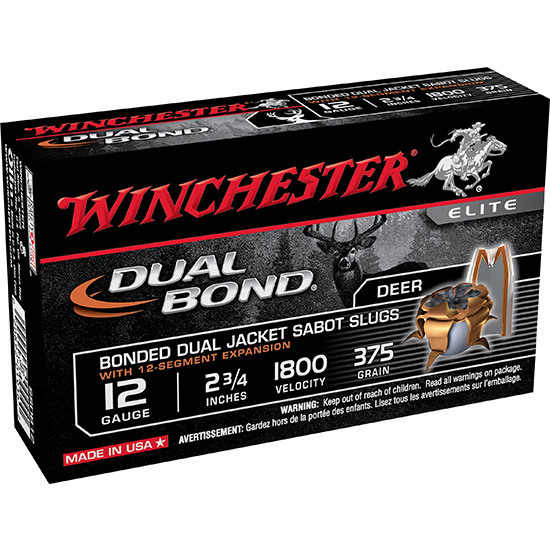 Winchester Ammo SSDB12 Elite Dual Bond 12 Ga 2.75 375 GR Sabot Slug Shot 5 Bx| 20 Cs in. Elite Dual Bond shotshells offer a large hollow point sabot slug which provides consistent upsets at a variety of ranges and impact velocities. The heavy outer jacket is mechanically bonded to the inner bullet. Its inner bullet utilizes a proprietary bonding process which welds the lead core to a second jacket which results in a design that provides for a combination of knockdown power solid penetration and significant tissue damage while retaining nearly 100 percent of the original weight.